Subject: No cameras please; my necktie is copyrighted. Laws extending the term and scope of copyright seem to have plenty of fuel. The various industries that rely on copyright have ample incentive to support legislation to help them through whatever hard times they might envision. While one may hope, out of a sense of public spirit, that the Supreme Court agrees with Eldred in its upcoming hearing, one might be left with a sense of pessimism that the waves of corporate interest are stronger than the sand castle of the constitution. If we were to use the financial backing of lobbies as a way of predicting outcomes of either court cases or legislative votes (someone must have published a study on this), then the public domain advocates have little chance of wearing down the "in perpetuity" folks who seem to wish the public domain, like some weedy wilderness, would just go away. Likewise, privacy groups would seem unlikely to win in struggles against the "I can sell you better products if I know more about you" group. There may be a large "privacy lobby"; I don't know. It seems rather an oxymoron, since privacy advocates are, by nature shy, and probably harder to detect than hobbits. So how might the skate-board of privacy grab a ride on the bumper of the copyright bus for a block or two? Suppose we begin to assert and flaunt those incidental copyrights we acquire through our life in a modern society. Every so many moments, as our intellects bounce off the molecules around us, we leave traces in various tangible media on the other side of the Gulf of Mind-Body. These traces are our behavioral by-products. Might we not be able to beat off an occasional telemarketer, an off-shore data-mining operation, or even the neighborhood grocery store which sells our grocery lists to the neighborhood data-warehouse, by reminding them that we, not they, created all those data and are, by all that is legal in a just society, its owners? So, no, you may not sell my grocery list. I happen to be a chef; but even if I weren't, I still own the copyright on the list comprised of my undeniably original use of the particular 40 products I happened to put in my shopping basket on May 3, 1999 (did you ever see anyone put kumquats, artichokes and habanero's in the same tunafish casserole??). The grocery store may claim they are acting as my publisher and that they, therefore, own the rights. But if we look at the direction the cash flowed, in this alleged work-for-hire, it looks more like I have employed them than vice-versa (yeah, I know: "try telling this to a photo studio"). But absent a contract of employment or terms of services it seems like the most they can claim is first serial rights. No you may not take my picture; the estate of Jerry Garcia owns the copyright on my necktie. Unless, of course you are a necktie salesperson, since Section 113c says "copyright does not include any right to prevent the making, distribution, or display of pictures or photographs of such [useful] articles in connection with advertisements or commentaries related to the distribution or display of such articles." Well -- there you have it: the real reason some grocery stores sell neckties is to be able to take pictures of their customers! No you may not sell the list of all videos I rented prior to Congress's passage of Title 18, Part I, CHAPTER 121 Section 2710 <http://www4.law.cornell.edu/uscode/18/2710.html> (some gentlecongressfolk apparently got nervous that someone might do to them what they did to Supreme Court nominee Bork). That's my list! It is original self-expression; and the rental store did me the favor of fixing my expression in the tangible medium of their database. As with common carriers I have given them implicit license to store my copyrighted data so that they may help me as both a customer and as the movie critic who may one day make a fortune by selling my list of the 50 best films of all time. You may not sell my driving records -- they are the collage of my expression in the medium of highway safety. Sorry, but the medicines I purchase, over time represent the choreography of my dance through the archives and halls of health. Neither might you eavesdrop on my brainwaves, monitor my eye movements, nor record my snoring, since those recordings, if created, would be owned by me. Frankly, if these kinds of my original work should come to rest in a tangible medium I might prefer the expression to be destroyed -- except for maybe the snoring, a talent it took me years to cultivate. Okay, how far am I going here? If a Mom who abuses a child is caught on film, we do not expect courts to use her copyright on either her attire or on her pugilistic art as grounds to dismiss the photographic evidence as wrongfully obtained. But if just occasionally, in one random jurisdiction or another, a citizen brings and wins a case of privacy invasion on grounds of copyright infringement, then perhaps justice will have been served. If those invisible privacy folks would start to assert their rights not as given from the fourth amendment nor as granted by various oddball sections of Title 18, but rather from Title 17, then either the copyright laws may have to back off or else the snoopers will. That might make for a more interesting contest than the ones that have one-sided financing. Just like in old Archibald Willard's patriotic picture "Spirit of '76", it's nice to have a good fife to follow, especially if it's playing Yankee Doodle. Grab on the bus! Note(1): "Spirit of '76" is currently in the public domain, since Willard seems to have distributed copies of it quite broadly-- pewter artwork derived from it was even presented to President Ford. 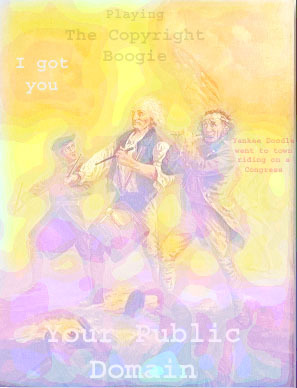 Alas, Yankee Doodle may not be in the public domain. Though it has probably been played in the presence of Presidents, and was a rallying cry in the formation of our "re-public domain", its unknown composer(s) never authorized the various copies of the tune that have been circulated (though some early lyrics seem traceable to a fellow named Shackburg http://memory.loc.gov/ammem/today/apr19.html ); hence by extension, the tune was never published and is still under copyright. On behalf of its rightful heirs, I hereby request that all proceeds from Hollywood's 1942 musical "Yankee Doodle Dandy" ("one of Hollywood's greatest, grandest and slickest musicals", according to http://www.filmsite.org/yank.html) and accumulated interest on those funds, be donated to a nonprofit organization to promote the public domain -- it appears that George Cohan's song "the Yankee Doodle Boy" used in the movie reproduces the older familiar tune repeatedly, and worse yet, derivatively. Note(2): Please don't take any of this too seriously, especially notes (1) and (2).